Amongst the bargain bin DVD’s in Tesco as I was going around this week was a copy of The Nativity Story, the glossy telling of the Christmas Story that came out last Christmas. Putting aside the irony that Tesco have shelves full of crackers and decorations already but have chucked a telling of the meaning of Christmas into the bargain bin, I picked up a copy, and this afternoon sat down to take a look. Largely as would be expected, it’s biblical accuracy extends as far as being a generally pretty straightforward version of the traditional Christmas story that everybody knows, so we get the basic story from Luke, inter cut with the wise men travelling (who incidentally have their traditional names), and then switching fully over to the Mathean story after the shepherds. Mary and Joseph then escape to Egypt, and the part of Luke where Mary and Joseph take the baby Jesus to the temple in Jerusalem are ignored. I’m not overly surprised as it comes as a bit of a shock to most people that there are two totally different birth narratives in the Bible, and much as with Carol Services the world over, the problems are largely brushed under the carpet for the purposes of the story and not rocking the boat. Anyway, what is good though is that Mary is realistically young, indeed there are scenes at the beginning that deliberately re-enforce how young she is. There is also a good deal of symbolism throughout the movie, with pre-empting of later parts of the gospels occurring in a number of places, and also interesting symbolism around the angel Gabriel who generally appears as an apparition of man in a white robe, but whose arrival or departure is shown by a soaring bird. You also get a suitably scheming Herod, and thanks to judicious amounts of CGI a pretty convincing image of Roman Palestine. One other interesting aspect of the film worth mentioning is the soundtrack. Written by Mychael Danna, brother of Jeff Dana who provided the score for Gospel of John, the score combines traditional sounds with a regular orchestral score, but also at key moments uses some very familiar carols – in Latin – intertwined with the other music. The best known are O Come, O Come Emmanuel and Silent Night which occur at key moments in the film, but there are several others to spot too. 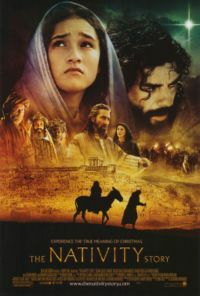 All in all, it’s not a bad film, and certainly is one of the better movie versions of the nativity I’ve seen. The cast is pretty good, although having watched Alexander Siddig for years on DS9 there is some amusement in having him turn up as Gabriel in this. It also doesn’t stray too much into the realms of Mel Gibson style fantasy additions to pad out the story, with the additions needed to pad the simple story in the Bible to a movie fitting in and underlining aspects of the story without adding anything theologically significant. If you’re looking for something to explain the religious significance of Christmas, it’s certainly worth digging around in your local Tesco bargain bin to see if you can find a copy.